Recent release “Twixt Friends and Foes” from Page Publishing author George Proferes details the multiple conflicts that arise when Marc Lorenzo agrees to defend a local realty investment group against accusations by the village mayor. According to author George Proferes, a retiree from two previous careers, a thirty year stint in criminal justice followed by several years supervising a counseling program for a community-based agency, “I began what I like to call my third career writing novels a decade ago and I have found this to be a most rewarding experience.” The author and his wife make their home on the eastern end of Long Island. Published by New York City-based Page Publishing, George Proferes’s intriguing work is about criminal attorney Marc Lorenzo who finds himself in conflict with his own law partner, the village attorney Andrew Fanelli, and his former colleagues with the county’s homicide division, when he agrees to defend a local realty investment group against accusations by the village mayor. His clients soon become prime suspects when a witness for the mayor against these five men is found murdered. This fast-paced thriller is filled with interesting characters and surprises, including a potential involvement between Lorenzo and the murdered girl’s sister that will serve to captivate its readers to its final conclusion. 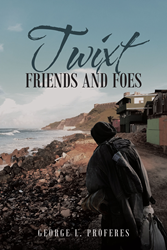 Readers who wish to experience this riveting work can purchase “Twixt Friends and Foes” at bookstores everywhere, or online at the Apple iTunes store, Amazon, Kobo, Google Play or Barnes and Noble.